April kick-started this year in Munich with the 2019 SMX Munich Conference. Two days full of knowledge and inspiring sessions conveyed by online marketing figures, such as Rand Fishkin, Jim Sterne, John Mueller or Mike King. 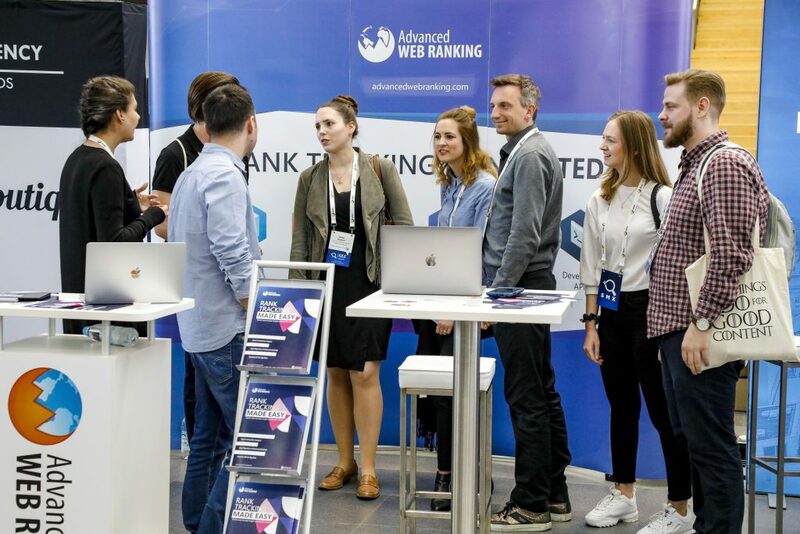 With over 80 world-class speakers and 1600+ attendees, the SMX Munich proved once again to be one of the most important (if not THE most important) SEO and SEM conferences in Germany. We’ve been there, meeting with YOU, lovely people, but also taking notes and picking ideas. So, in case you missed the event, here’s our list of favourite SMX Munich 2019 talks and key takeaways. 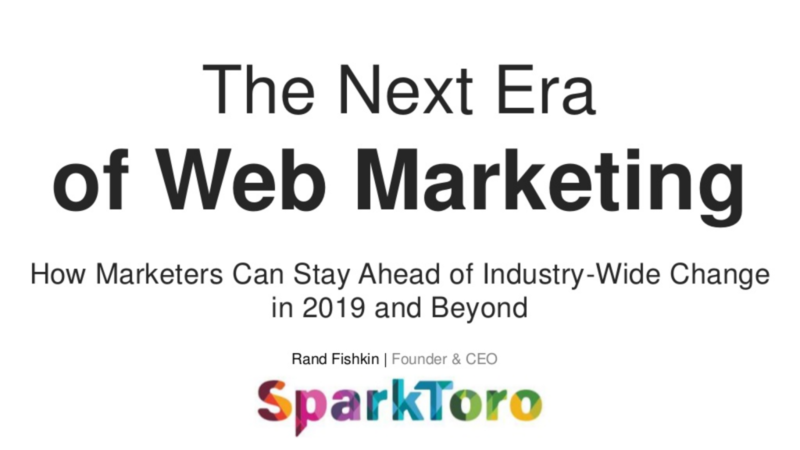 1.”The Four Horsemen of the Web Marketing Apocalypse”, keynote by Rand Fishkin, Founder of SparkToro. 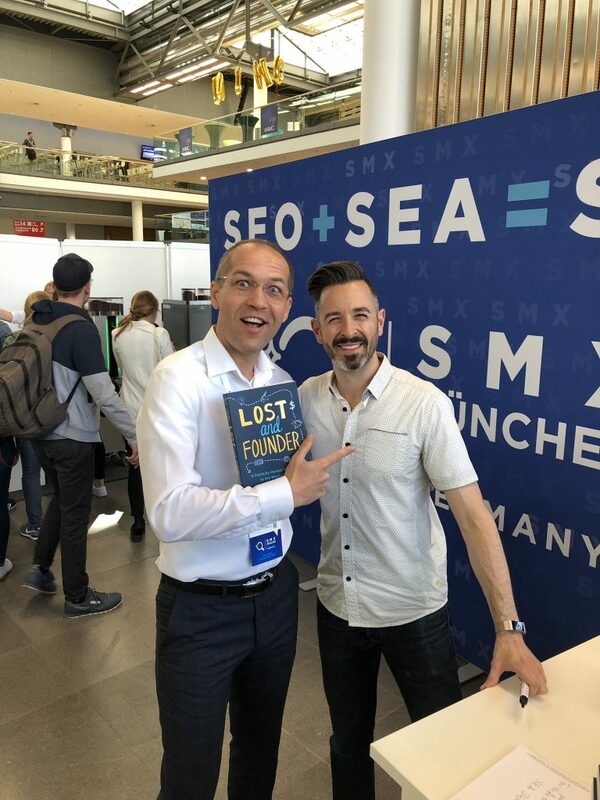 This year’s SMX edition was opened by one of the most awaited presentations, coming from Rand Fishkin, founder of SparkToro and one of the world’s most popular SEO experts. During his talk, he focused on mastering web marketing strategies in the challenging world dominated by Google. Google is making marketer’s lives harder and harder. Organic traffic rates have been steadily decreasing for a few years now. That’s because Google is now aiming even more to deliver the answer to search queries itself. Users no longer need to visit a website to find answers to their questions, but receive all the relevant information straight from Google’s direct answers and visual SERP Features. The organic traffic received via social media platforms has also been falling for some time. This occurs because social networks such as Facebook or Instagram are aiming to keep users engaged as long as possible, without directing them to other websites. Even though companies are investing more and more in paid advertising, the ROI of these promotions is decreasing. Obviously, many companies would rather focus on growth, instead of profit. As a consequence, the competition for the top positions is harder and, in order to remain visible on paid search, ads with higher bids are unavoidable. To remain successful despite these challenges, Rand encouraged companies to focus on building brand awareness and targeting customers directly via email marketing, for example. 2. 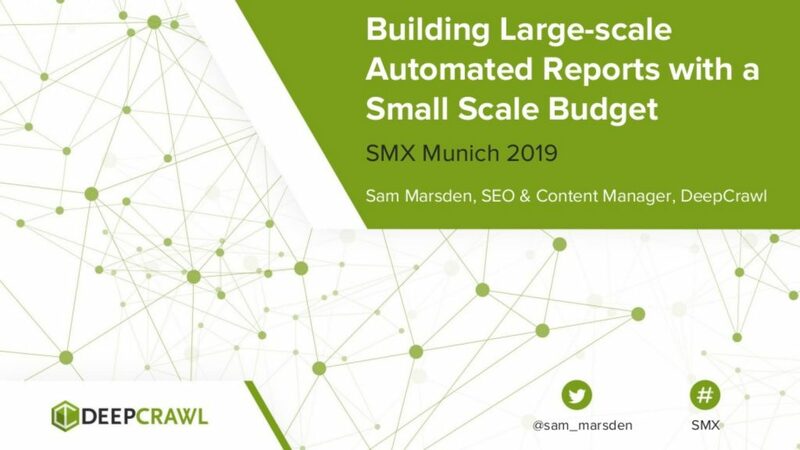 “Building Large-Scale Automated Reports with a Small-Scale Budget”, by Sam Marsden, SEO & Content Manager at DeepCrawl. Sam’s presentation focused on one of the most common problems that marketers are struggling with: time – money efficiency when it comes to proving efforts to customers. The greatest struggle he talked about is that stakeholders want more data, in less time, on a higher frequency. 3. “This Time, the Robots ARE Coming”, keynote by Jim Sterne, Founder of Marketing Analytics Summit. In his keynote speech, Jim Sterne introduced the story of a dark Sci-Fi future, when “the bots are coming – and marketing will become weird”. Though, Sterne thinks that today’s voice apps are still in their early days, when it comes to the development goal: the personal assistant, who is ready to take over tasks and work independently. Together with the audience, he ventures a look into the future and emphasizes that machine learning is aiming to help us do our job better, not entirely replace it. Machines are very good at detecting correlations, spotting patterns and classifying data. Interpretations of results and creativity still make the human brain more suitable. This will definitely impact the area of consumption and marketing. Besides web search, marketers will also have to deal with content optimization for voice search, augmented reality or facial recognition. Customers will be dealing with content in more diverse environments, such as voice control in cars. Sterne predicts that something will change in how personal data will be manipulated. He believes that, in the future, there will be a central container in which all personal data will be stored, allowing various services such as Amazon, Facebook and others to access it. Centralized data storage is secure and trustworthy. 4. 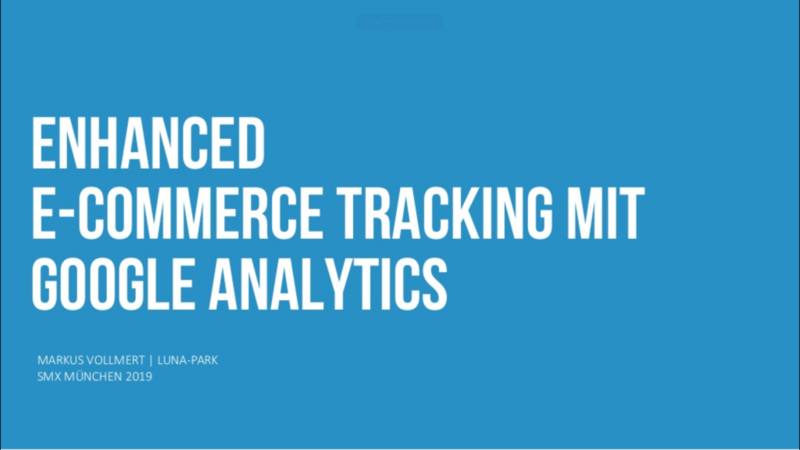 “Enhanced E-Commerce Tracking with Google Analytics”, by Markus Vollmert, Founder and Managing Director at Luna-park. Markus’ session was presented in German and focused on improving tracking for E-Commerce businesses, with key actionable insights on what to keep an eye on and how to unlock the full potential of Google Analytics reporting. Enable Enhanced eCommerce in Google Analytics and start tracking “promotions” and “impressions”, to achieve a more comprehensive image on how customers are interacting with your product pages. Make sure to track down the entire e-commerce funnel, from the moment users are landing on your product pages, until they reach the final purchase action, through shopping cart behaviour. Use dedicated tracking calls for each product category, to see how users came in contact and interacted with the product. 5. “Building the LEGO Search Strategy with Content Marketing”, by Luis Navarrete Gómez, Head of Global Search Marketing at LEGO. The Head of Global SEM at Lego figured a way to showcase their marketing strategy and prove how to use content efficiently across channels, aiming to improve the user search experience. Stellar content marketing should address needs and messages should use specific channels, based on targeted audiences. Luis used the Lego brand to show how the company uses marketing promotions online for content and how they generally address different age groups, from toddler to parent. 6. “SEO Fight Club”, moderated by Marcus Tandler, Founder & CEO at Ryte. At the SEO Fight Club, Marcus Tandler had experts debating about the pros and cons from various controversial SEO theories. The audience voted before and after the talks, convinced by the arguments brought in by the presenters. The winner was the one who could change the majority of the audience. Topics included AMP pages, Progressive Web Apps (PWA) and link building. It was not just about right or wrong, but more about the perspective from which the expert assessed the individual topics. 7. “First Data for Google’s March 2019 Core Update and Deconstructing and Leveraging Good Content with Data” by Marcus Tober, CTO and Founder at Searchmetrics. The talk by Marcus Tober, CTO and founder at Searchmetrics, focuses on data analysis for the Google March Core update and compares which pages and factors have changed. Using 2 different websites to showcase the strengths and weaknesses after each of the latest Google updates, Tober saw that optimizing for keyword rankings is not always the key to success. UX became a key component analyzed by Google when determining how powerful a website is to answer searchers’ needs. Another finding was that the word count started to have less if no meaning at all when it comes to Google rankings. Focusing on SEO factors when writing content and forgetting about UX will not speak Google’s language after the latest Core Algo updates. Content is for users, not search engines. Ranking factors must fit the particular business. 8. “Voice Search Deconstructed” by Nick Wilsdon, Search Product Owner at Vodafone. Nick’s speech was about the current state and actual possibilities available today with voice systems. The Search Product Owner from Vodafone is already recognized as a guru when it comes to Voice Search techniques, and during his presentation at SMX Munich this year, he showed the current state of devices and apps, as well as explained how to prepare information for them. Optimizing content for voice search is often the same as optimizing for Featured Snippets or Knowledge Graphs – there aren’t any unknown techniques. Whenever I see posts like this I get all fired up to go attend a conference because without reading first hand stories I always wonder if it will be worth it. This conference looks like it was PACKED with good info.